The topic of hell has raged throughout the centuries, and the controversy about its reality remains strong even in Christian circles, where the idea that hell is a place of eternal torment is the view most widely held by Christians today. Both Bell’s and the former pope’s messages were received with joy and anger alike. In response to these messages, R. Albert Mohler Jr., president of the Southern Baptist Theological Seminary accused the pope of “soft-selling hell. … Jesus Himself spoke of hell as a lake of fire, where the worms would not die and the fire would not be quenched. It’s all very graphic.” Most Baptists believe sinners are suffering right now in eternal torment. And then scholars such as England’s Dr. John Stott, asserting that the belief of eternal torment is based on pagan philosophy, teach that such a view of God is inconsistent with the biblical portrait of His character. Stott and other prominent Bible teachers propose that the fires will ultimately put the unsaved out of existence—not hold them in eternal agony. He explains that while Jesus did make it very clear that there is a real hell (Matthew 10:28), He explained something vitally significant in the parable of the wheat and the tares—“As therefore the tares are gathered and burned in the fire, so shall it be in the end of this world” (Matthew 13:40). According to Stott, the implications are obvious. First, in sharp contrast to the claims of Vatican City, hell is a real place where the “children of the wicked one” (Matthew 13:38) will be “burned” (verse 40). Yet contrary to the Southern Baptist Theological Seminary, nobody has gone there yet. Is it the pope, Rob Bell, John Stott, or Christians who continue in the tradition of Jonathan Edwards, a Puritan preacher who traveled throughout 18th-century New England proclaiming that “there will be no end to this exquisite horrible misery” of the ever-burning fires of hell? According to some surveys, 64 percent of Americans believe there is a hell, but only 34 percent believe it is “a real place where people suffer eternal fiery torments.” A surprising 53 percent view hell as "an anguished state of existence eternally separated from God.” But percentages don’t equate with Bible truth. The makers of this website believe there is firm Scriptural truth about hell, and that your questions deserve sound Bible answers. 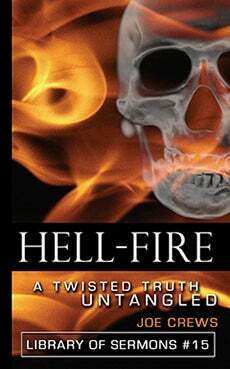 This site is wholly devoted to exploring and demystifying the Bible topic of hellfire. We believe the truth, as it is in Christ, can both broaden our understanding and draw us into a closer relationship with God. If hellfire perplexes or scares you, or if you’re looking for answers instead of questions, we encourage you to spend a few minutes with us as we explore this controversial topic through videos, articles, and links.